“Genre unknown.” Have you ever gotten this message when you download a kirtan CD into iTunes? We get it a lot. More often than not, the iTunes database pulls up a blank in the “Genre” category. Sometimes it pulls up as World Music, sometimes Alternative, sometimes Folk (Shyamdas in particular), and sometimes — get this! — Country (GuruGanesha’s Kundalini Surjhee). Occasionally, the disc is downright Unclassifiable (Marti Walker’s rEVOLution). And yes, sometimes it even registers as New Age, which usually elicits a sarcastic snicker from this downloader. 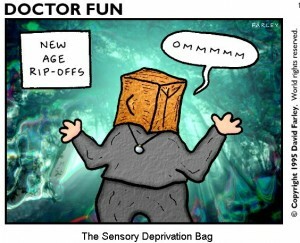 New Age? Hasn’t that almost become a kind of throwback-to-the-70’s joke? Something that is spoken of with “air quotes,” maybe with a roll of the eyes thrown in? Is kirtan New Age? Does it want to be? Well, according to the Grammys, it is. That’s the category for which Krishna Das is in the running for Best Album, marking an historic moment in bhakti history (watch the livestream Sunday, Feb. 10 from 1–3:30 p.m. PT at GRAMMY.com and CBS.com.). No, he’s not the first kirtan artist to get a Grammy nomination — Jai Uttal earned that honor back in 2002 with his barrier-breaking, genre-bending Mondo Rama. But this is Krishna Das. The Yoga Rock Star. The King of Kirtan. The Chantmaster. And Live Ananda, the recording nominated for this year’s Best New Age Album, is pure and traditional unadulterated call-and-response chanting. In the live. No apologies for the harmonium. Will the tux be in plaid? Still, we have a hard time imagining Krishna Das describing himself as a “New Age artist.” We could be way off base here, but we’re not seeing it. You? Either way, that’s where we are folks. We don’t know about you, but we’re putting our bets on Krishna Das actually winning this thing. Why else would he be performing live at the Grammys pre-broadcast livestream? (New Age nominees are never featured on the Grammys live television broadcast, which is reserved for the big “Mainstream” categories.) We’ll eat crow if we’re wrong. Whilst brooding. Heavily. And chanting along with the Cosmic Kirtan Posse at Ananda Ashram to soothe our pain. 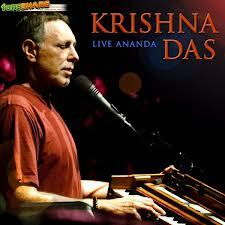 But let’s just say it happens: Krishna Das wins the Grammy for Best New Age Album. That would put him in the same Winner’s Circle as Paul Winter (6 times), Enya (4-time winner), Yanni, Pat Metheny, and David Darling, among others you’ve probably never heard of. Notably, Peter Gabriel won the award for Best New Age Performance in 1990. KD’s competition for the award this year? L.A.-based pianist Omar Akram; Michael Brant DiMaria, an integrative psychotherapist who creates music for relaxation and meditation; Celtic artist Loreena McKennitt; renowned cellist David Darling; pianist/composer/producer Peter Kater, and Steven Halpern, whose 1975 release, Spectrum Suite, often gets credit for beginning the whole “New Age Music” movement. There are a couple interesting kirtan connections among these other nominees. David Darling collaborated with Canadian kirtan artist Brenda McMorrow on her 2010 album Love Abounds. Peter Kater just last year released Heart of the Universe with Sikh-tradition chantress Snatam Kaur, and his 2012 nomination, Light Body, features vocalist and executive producer Trish Bowden. We’re clueless, we confess, about the others on the list, but a quick review of their offerings puts them pretty far away on the musical spectrum from call-and-response chanting ala Live Ananda. Incidentally, in the World Music category, both Ravi Shankar (for The Living Room Sessions, Pt. 1) and his daughter, Anoushka Shankar (for Traveller) are nominated for Best Album. Which makes us wonder why Krishna Das isn’t in the World Music category. Live Ananda even comes up on iTunes as World Music. New Age music has always been difficult to define, seeming more like a catch-all for downtempo “relaxation music” than anything else. Early pioneers include the aforementioned Steven Halpern and English composer Brian Eno, who is credited as a principal innovator of so-called ambient music. New Age first earned its own Grammy category in 1987 — about the same time New Age bins started showing up in major record stores and big record labels starting paying attention to the genre. My how things have changed. Or not. All of this talk brings up a related issue that is astir throughout the kirtan world: what to call kirtan. “Kirtan,” some have argued, is just too hard for Westerners to wrap their tongues around, let alone their minds. A few artists are steadfastly moving toward the use of “mantra music” to define what they do; among them are Gaura Vani, a Krishna devotee who typically practices traditional call-and-response Sanskrit chanting (unless he’s in his role as one-fourth of The Hanumen, in which case all categorization goes right out the window), and GuruGanesha Singh, best known as the long-time touring partner and manager to Snatam Kaur, who infuses sacred Gurmukhi-language chants with funked-up rhythms and soaring electric-guitar riffs. 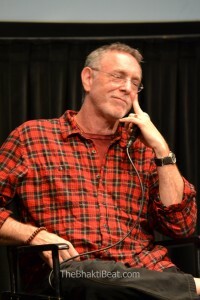 The new Krishna Das channel on Sirius XM radio eschews both these monikers in favor of “Yoga Radio” — a decision that came from Sirius, KD told us in an interview. Nowhere in the description of the channel will you find the word kirtan, but you will find “Chanting, sacred and spiritual music” in the channel’s subhead. Kirtan. Mantra music. Yoga music. Chant. Sacred music. Spiritual music. World music. Alternative, Folk, Country…turns out there are almost as many names out there for this “music genre” as there are artists presenting it. Which begs the even bigger question: is it a “music genre” at all? Or is the Mantra Revolution simply “Unclassifiable”? I call it chant, I call it grace music, I call it my practice, and I’m no new ager at seventy any more than Mick Jagger is a boy–but why quibble. Categories are never sufficient to describe what’s really going on when it comes to the musical vibration, and who cares. He’s there, and NKB is taking him to the mainstream, to “15 minutes of fame” as Andy Warhol tagged it. Ram Ram and onward! Agreed! It’s all academic…just chant already! Ram Ram. Thank you Sahadev. I love your definition…but have to admit that the term “Sacred Music” conjures up for me those horrible dirges played (badly) on the organ during Catholic Mass…but that’s just me! Appreciate your feedback! Good call. Some “kirtan” projects are less traditionalist than others, but fall into the same groove. “Sacred Music” opens it up enough to embrace not just Kirtan music from the Vedic tradition, but also can include sacred chants from various traditions and innovative approaches.. I call it kirtan. It’s not that difficult to pronounce, and after having to introduce the concept that my guru (and that I have a guru) gave me a spiritual name…..explaining what kirtan is? Piece of cake. Heheh; thanks Karuni. So…what is your 30-second explanation of what kirtan is? Let’s hear it! Personally I call it Kirtan… That IS what it is afterall. When someone gives me the tip of the head puppy dog look, I go a little further and say “Chanting the Sacred Names”… “It’s a part of my practice…”. Why would we change the name or call it something different after 5000 years ??? Afterall if someone is really that curious about it, there’s allways Wiki-pedia. You actually make it seem so easy together with your presentation however I to find this matter to be really one thing which I think I would never understand. It kind of feels too complicated and extremely wide for me. I am looking ahead in your subsequent put up, I will try to get the hang of it! WHITE SUN is Grammy nominee chant artist this year(2017 Grammy) . Mantra will win!